Some time ago, I was playing with some sculpy clay and ended up making a set of little skulls. Each was lovely and creepy and could sit on top of a quarter. Nine skulls were plain, and a tenth had a witch hat. I never knew what to do with these little lovelies- they remained unpainted, and would occasionally come out on an altar, but never with much more purpose than just to represent ancestors. One of my trad teachers told me I’d need to ask the ancestors on how I’d like to use them. I can’t remember if I ever did consciously. But after a few years, I’ve finally had it pop into my head on how I should use these little creations- I’m going to use them to represent 9 archetypes of spiritual ancestors. The tenth skull, with the witch hat, will be something I keep to represent myself, a product of the spiritual heritage of these archetypes. When I say archetypes, I don’t necessarily mean just them as archetypes. I may connect with specific ancestors of that role, but I just haven’t yet. These archetypes aren’t just about being a witch either, but also intrinsic, at least for me, to being woman. These are archetypes I’ve found that, in different ways, resonate with the path that I follow. I’d like to eventually incorporate honoring and working with them into my practice. For now though, I must get a few hours of sleep then get back up to study for a quiz! About our Litha ritual tonight! As the Middle TN group of Forest’s Edge members prepares to celebrate the summer solstice this Saturday, I once again found myself making masks. 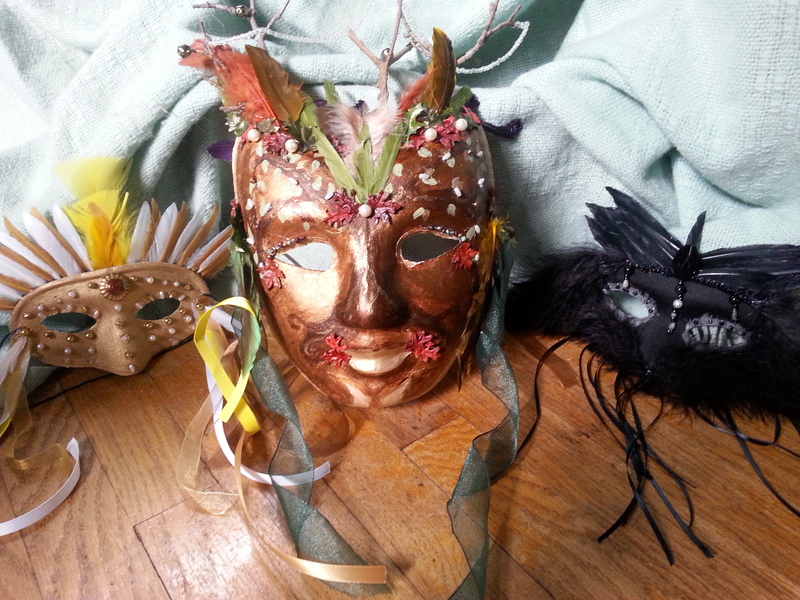 A few of us have been on a bit of a ritual possession kick lately, and while our Beltane festivities took more of an appreciating-nature approach, we used masks during Ostara to help us ally ourselves with and even experience “being” March hares. This time around, our observence will involve a ritual drama, in which the tension between the forces of light and dark provide the doorway for the Fey to move through to and from this world. Masks will be the ritual tools that will aid the members taking on these roles to embody them in more of a ritual possession, “drawing down,” shamanic way, rather than just acting the part. I promised a better post in a few days, and here it is! I’ve been on a life break for a while. I’ve had to deal with crippling money issues as well as working to get back into school. My return from medical leave was approved, yay! But then I had a very large sum of money that I had to pay back in order to be able to register (well, large for someone as currently poor as I). My mother was able to loan me the money, so I’m going to be able to return to school in the Fall. I’ve got my classes lined up already. This year will be my last, I hope, and focusing mostly on my major. For all those Greek lovers, out there, you’ll love what I’ve got picked out- The Greek Myths, Greece and the Near East from Alexander to Theodosius, Warfare in the Ancient Mediterranean, The Parthenon The Akropolis and 5th Century Athens, and then to finish up my required courses for liberal arts bit, a US History course from the Reconstruction through WWII. Granted, I haven’t guaranteed all of these yet, but I will mid summer. As far as witchy things have been concerned, I’ve been quite lazy. I’m kicking myself a bit for that, but I know I did really need a breather from it. Or, less it and more of my list of large expectations that I always create and rarely follow through on. I’ve been working a lot with my ADHD management and trying to create more realistic goals. While they don’t always succeed, it’s a slow learning process. At least I’m making a little progress. My job is icky, but it’s a job and I know I’m very lucky to have one right now, considering I haven’t finished my bachelors. I’m still wanting to become a librarian and I’ll be working at the library again in the fall, but unfortunately they were full up over the summer. Our tradition is booming, we had a lovely open Beltaine ritual focusing on bees and we actually have added a new student. Yay! So stoked. I need to finish up my lesson review and focus on what I need to so I can eventually proceed with initiation. I’ve been playing a fair amount of computer games recently, many with DHMF. He loves that nickname and you guys aren’t allowed to know what it is, but it is funny at least. We are still whatever we are, but he makes me happy and that’s all that matters. I’m hoping to get a nerdy blog up and running soon, probably at the domain I’ve had set aside forever, but it will depend on other things as well. I want to write more, but I need to finish up some cleaning here so my apartment isn’t so gross. Garden pics are incoming, as well as hopefully quality writing and articles. Please ignore any rambling, I’m multitasking and a bit worried about my poor computer. She’s been having issues lately. Hey guys! So, I’ve been gone a few months. I needed a break from things. I had to prioritize parts of my life and get things together. I’ll be writing soon, new garden pictures and everything. Apparently the male friend wishes his moniker to be DHMF. He says I can’t say what it means, and if he ever moves to the boyfriend position, he wants to come up with a different one. Herp derp.